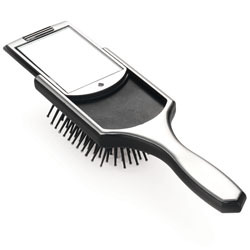 Use as a compact or use as a brush and check your hair with the easily detachable mirror. A light travel touch-up has never been so convenient. Massage your head with sturdy but gentle pincushion bristles and you never have to travel without a mirror.